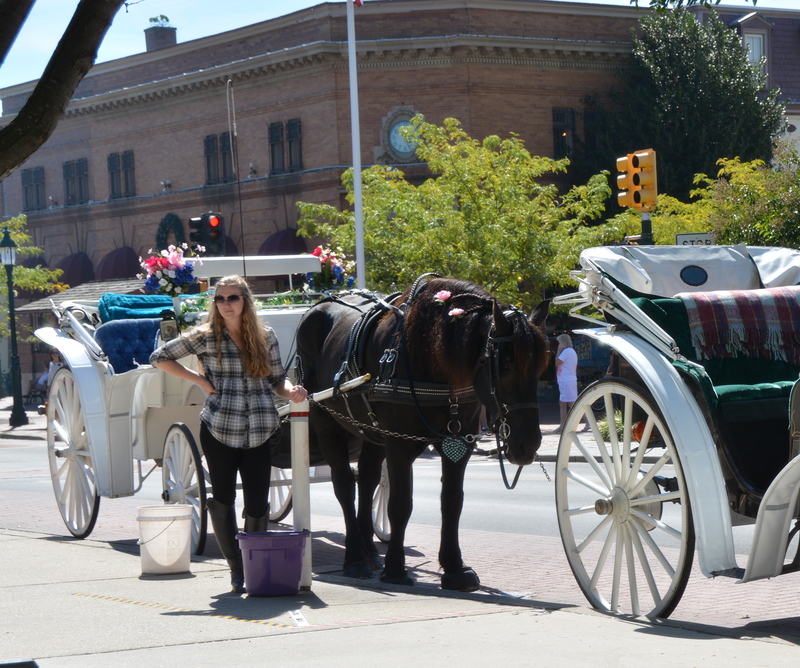 On our way to the Cape May Convention Center for the Sea Glass Festival Sunday, we happened to spot a horse drawn carriage. 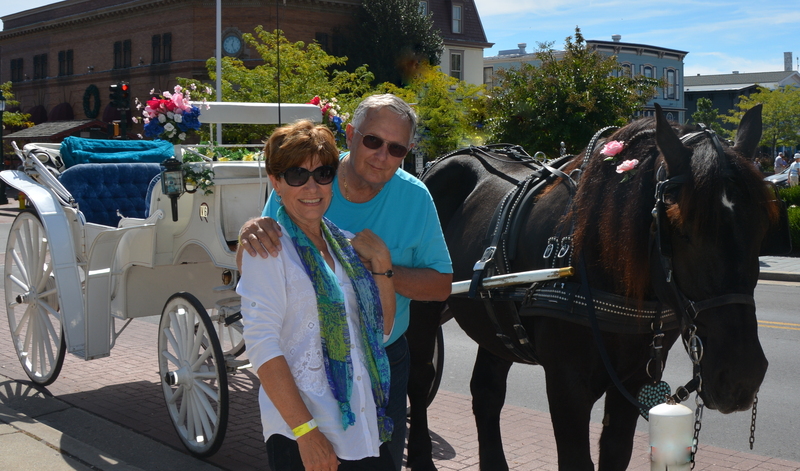 So, upon leaving the Festival, we asked directions and made our way to Ocean and Washington Streets and booked a ride with the Cape May Carriage Company. This is “our” driver (Devyn), horse (Shadow) and carriage. Devyn was SO friendly and knowledgeable about Cape May. Our ride took us by many beautiful old homes, inns and hotels, and Devyn shared the history of the town with us. For example, did you know that the spelling was originally Cape Mey? It was named for a Dutch explorer, Captain Cornelius Mey, in the 1600’s. The spelling was later changed to May. This is the Buttercup Cottage. No history on it, just a pretty little cottage. 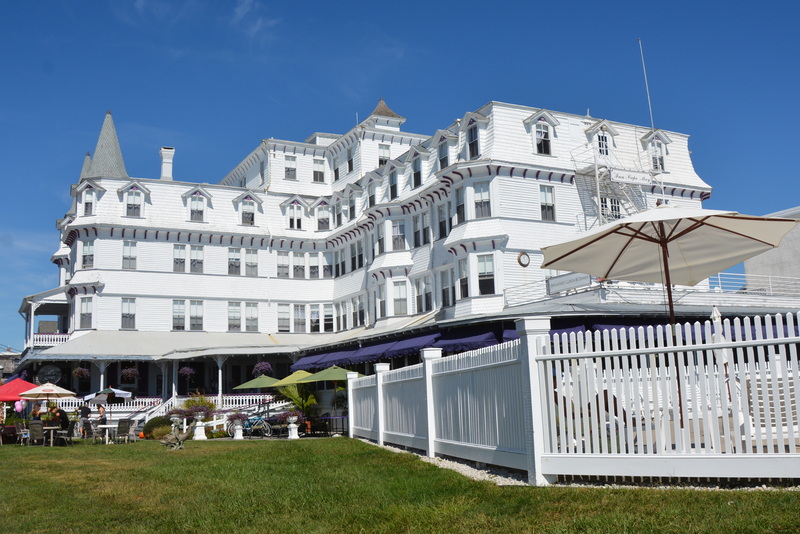 The Inn of Cape May, according to Devyn, was the first hotel in town to have running water in the guest rooms. It also claims the oldest elevator on the East Coast, the second oldest in the country. After our carriage ride, Devyn took our picture with Shadow. We explored the town a bit more, then stopped in this five-and-dime. 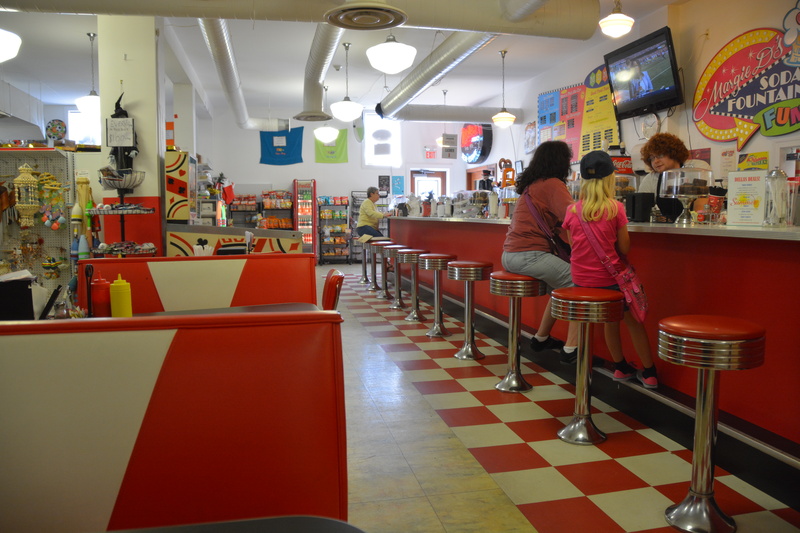 We had lunch (and ice cream) at the little soda fountain at the back of the store. And began our trip back home on the 4:30 ferry. 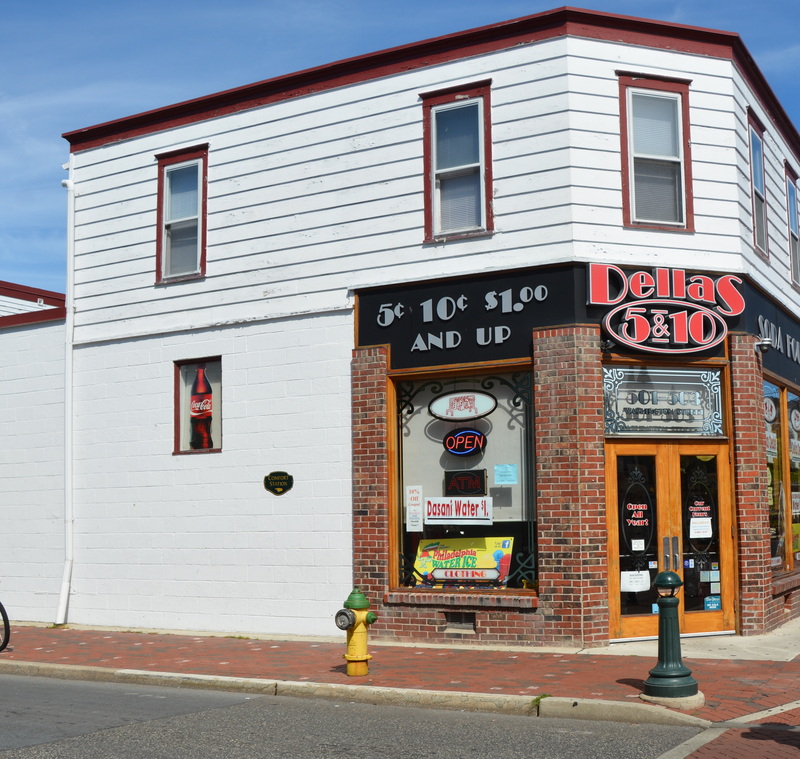 Although this trip to Cape May was a short one, we saw enough of the town’s charm to know that we’d like to return one day for a longer visit. And another carriage ride, of course. This entry was posted in Traveling Days and tagged cape may, cape may carriage company, dellas five and dime cape may, the inn of cape may. Bookmark the permalink. Oh so quaint! Who wouldn’t want to visit? You should add travel scout to your many talents. Love the Inn and the lunch counter – brings back memories. Looks like a fun place – very quaint – never been – thanks for sharing! It was wonderful, MJ! And perfect weather was a bonus! What a great day you had at the festival. 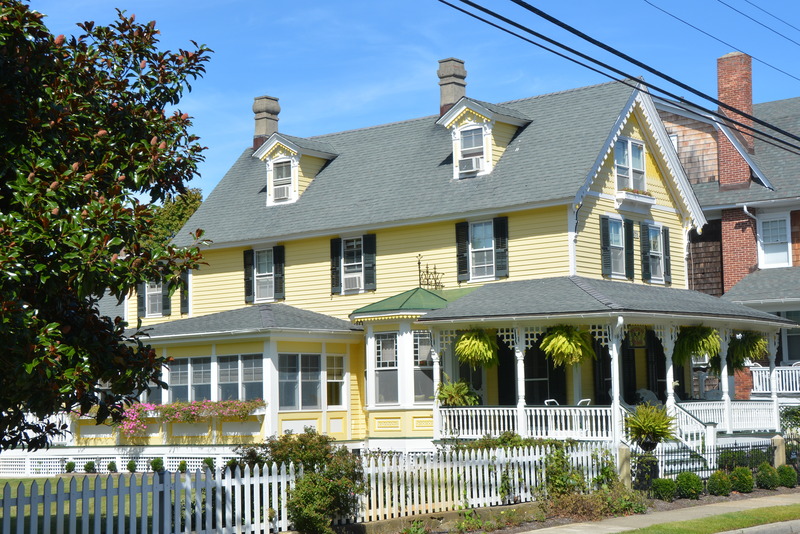 I just love Cape May – very charming city to explore. I stayed at the old Inn when I was there. 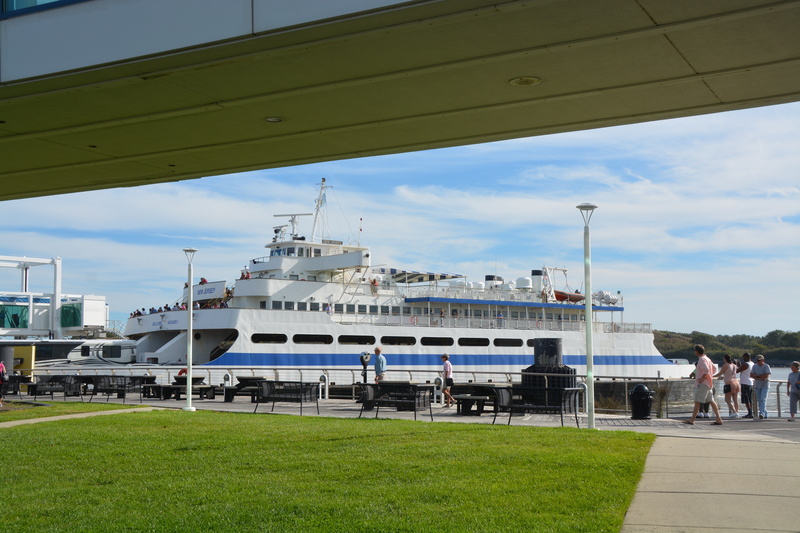 You sure had a gorgeous day for your trip. I loved, loved every photo! What a feast of Atlantic Americana for the eyes. Yes, indeed. Such beautiful lawns, flowers, and well-kept structures! What a lovely trip! I now have another place I want to visit!!! What a perfect little town to explore. No wonder it’s so popular. You always find special places to visit! I do think Cape May is worth a second trip. I’d like to go back there someday too! I can tell you & MM thoroughly enjoyed your visit and you got a carriage ride to boot! That HAD to make the trip extra special! The carriage ride was icing on the cake. As soon as Motor Man spotted that horse and carriage, he knew I’d want to go for a ride! What a wonderful day in Cape May! What a great daytrip! That counter at the five and dime reminds me of hot dogs with my Grandma way back when I was little! Buttercup Cottage is gorgeous! I could be very happy there.. especially on the front porch!!! Isn’t it beautiful?! Every home is like that: so welcoming and pretty. Short trip, but jam-packed ! Looks like a great day for a ride, and a lunch counter is always awesome- when you can find one! What a nice trip this looks to have been! Hi, Christy! Thanks for visiting today. I hope to have a look around your blog in the next day or two! I love knowing the Mey/May story! What a fun trip and thanks for sharing! I’d never heard about the change of spelling…. always nice to learn more about a place you visit. What a nice trip and beautiful day! Dave’s sister and her family live in Maryland and vacation in Cape May every year. Beautiful! What a great place. Cape May has even more to ofter than Chuck and I knew. I see another trip to this lovely area again in our future. So glad you and JR had such a good time on your short trip. A carriage ride sounds like fun and oh my that Inn is awesome looking. I enjoy seeing cities via carriage ride. They are delightful and informative. Love the little five-and-dime and soda shop! Your blog gives a compelling reason to visit here. And I live here. Totally appreciate perspective from another visitor. Thanks for sharing and don’t mind if I push it around town a little? Cheers.